These Two Bite Pies are perfect for Memorial Day, the 4th of July or any summer BBQ or potluck. Make the filling ahead of time for a great easy treat! I don't know about you, but I have really been loving all of the red, white and blue projects and recipes in anticipation of the 4th of July. I'll be a little sad to see them all go after tomorrow. The worst part is there isn't a fun food holiday in sight for a while after that. Is there? Am I missing one? Or after the 4th do we have to wait for pumpkin season to have something to celebrate?! I know... just the mere mention of pumpkin season brought twinkles to some of your eyes and the rest of you are rolling them. Ok. Fine. I'll move on. Back to the good ole Red, White and Blue! One of my favorite parts about cooking for the 4th, other that the patriotic part of course, is how easy it is to get the colors with berries. I LOOOOOVE berries. With all of the great fresh berries in the stores lately, I have been going crazy. I'd be perfectly happy making a different red, white and blue recipe with blueberries, strawberries, raspberries and cherries every day for the month leading into the 4th. You guys (and my husband!) would tire of it long before I would. So when Cindy's Recipes and Writings picked easy 4th of July recipes as this week's recipe, I knew it had to include berries. That brings me to these pies. 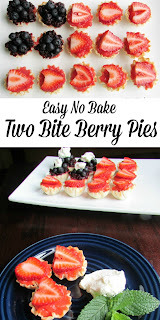 Two bite strawberry and blueberry pies that are no bake and so easy! They would be perfect for your Fourth of July parties. They would also be great for any spring or summer picnic. You can of course make just one flavor or the other. My husband, who doesn't even really like sweets all that much, kept going back for more to decide which he liked better. He couldn't decide. He said they were both a big win. I'll take it! 1. In a small saucepan, mix together lemon juice, sugar and cornstarch. Stir in 1 cup of strawberries.2. Cook over medium heat, stirring constantly. Either mash berries a bit or hit it with an immersion blender a couple of times. Cook until thick like a pudding. Remove from heat and stir in remaining chopped strawberries. Spoon into a bowl and refrigerate until ready to serve (up to a few days).3. Repeat process with blueberries.4. 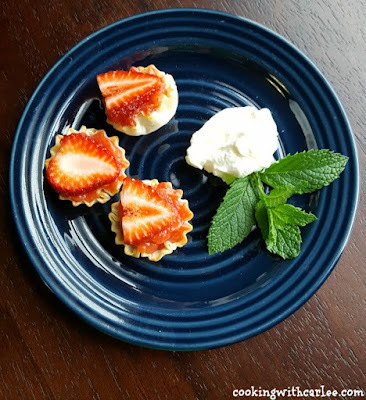 To serve: spoon into a phyllo cup, top with fresh fruit and serve with whipped cream.Note: I actually prefer the phyllo cups toasted up a bit. I would recommend that if you have the time. Do it ahead of time and make sure they are cooled completely before filling. Yum. What a delicious combination. I love the simplicity of the recipe. They are so cute. Perfect for a tea party, too. I want to have a tea party so bad! Thanks! SO cute and easy! Love these mini pies! And delicious too! Thank you! Wonderfully festive! Perfect for a backyard BBQ. Wonderful. I love how tiny and bite size your pies are. The photos are terrific too. Nice post. love love love these little beautiful berry bites! They would be devoured in an instant at my house! Cheers! Thank you so much, the three of us took out this tray of them in no time! Love little apps like these! 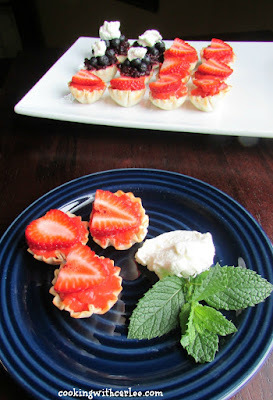 I made something similar not so long ago and they were an instant hit, and those phyllo cups make it so easy! Your filling sounds great. Thank you so much, Caroline! Carlee, I have not made one red, white or blue dessert! I should be ashamed, seriously. 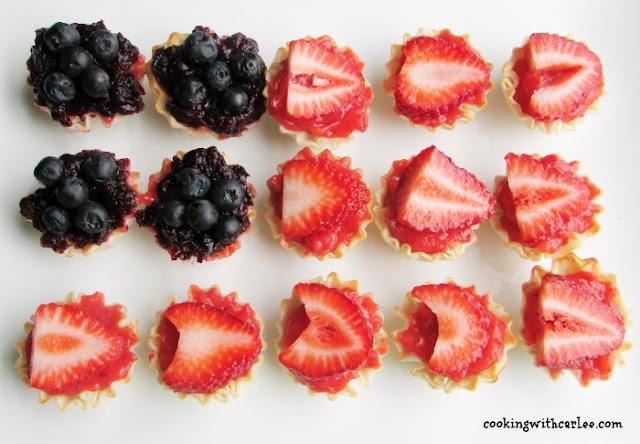 I love these little berry pies. So cute! And your pics are gorgeous. Happy 4th! There is still time, Michele! Thanks so much and happy 4th to you! These sound like the perfect bite! These look so good! My kids would love them! Such a cute idea for bite sized dessert. Thank you for sharing at Merry Monday!! They would be perfect for you guys to make together! I hope you both love them! How cute! Great party food! Thanks for joining us at the Family Joy Linkup, and hope you'll join us again this Sunday! I think you're right - nothing fun and foodie until Halloween, unless you get creative with "back to school"? I love your mini pies. It's a mix of nice to have the break after all of the winter/spring/early summer food holidays and totally sad to not have something specific to be creating for! Thank you! What a awesome dessert, we will love your Two Bite Berry Pies! Thanks so much for sharing with Full Plate Thursday this week. Hope you are having a great day and come back to see us real soon! Thanks, Miz Helen! Have a great one! Girl, you have the best ideas in recipes. I love that these don't take much sugar, I've been needing to cut down on that. But there's not much in these at all. And they look so cute and delicious. How could you stop at just one? Thanks, Kim! I'll be sure to be by! What a perfect summer dessert! They are cute, easy and good... my favorite kind of recipe! Thanks! Very cute and easy! I might make these just for my immediate family and I. That would be perfect! They were so fun to make and they didn't last long here! Those are so cute and two bites of something sweet is about all I want when it gets hot! Thanks for sharing on #Celebrate365 Patriotic Party. I am pinning this one! Two bites...I don't know...I might be able to conquer these in one bite!! !